*Sigh* Where would a hot dog be without a fluffy bun to hold it in place? It would just be an oblong piece of meat rolling back and forth on your paper plate. No one wants that! It would be pretty difficult to eat and it would taste very...blah. On the other hand, what if you were sitting down to eat a plain bun? Nothing is on it, no butter, no cheese, just a plain crusty bun. Doesn't sound too appetizing, does it? That's why hot dogs and buns need one another. This awesome food-related couple's costume will promote the idea that you and your sweetheart believe that buns and hot dogs need to stay together! Now the only tough question that you have to tackle is: who wears the bun in your relationship? These hot dog and bun costumes are a great deal because it comes with everything you need to transform into everyone's favorite fair food. We recommend wearing black clothing that you already have in your closet underneath these plush tunics. Put the hot dog or bun tunic over your heads and let your arms, legs, and head pop out of the appropriate holes. Just like magic, you've transformed into your favorite summertime snack! 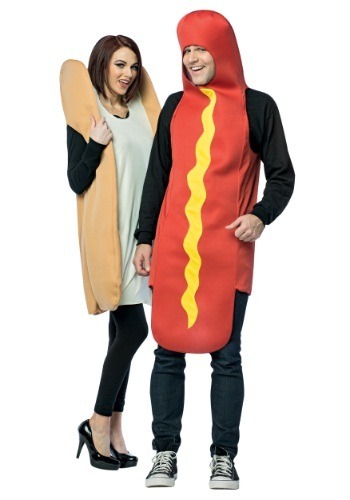 We recommend this couples' costume for foodie people who feel strongly that hot dogs and buns need to stick together. One wouldn't be as good without the other, much like your relationship, so it's more than just a costume... it's a metaphor for your love!